What are your nails saying about you? Healthy nails . . .
Of course, slight variations are normal and no reason for panic, but here’s a guide to what specific issues could mean. Pitting – “Pitting of the nails could be psoriasis,” says Dr. Graf, adding that in some cases, it could be a symptom of a connective tissue disorder. If you see small depressions or irregular contours in your nail bed, it’s time to visit a dermatologist. Clubbing – Surprisingly, the tips of your nails hold hints about your lungs. “Clubbing of the end of the fingers can be suggestive of pulmonary disease,” Dr. Graf explains. Colloquially known as Hippocratic fingers, this condition is easy to identify due to its “inflated” appearance. “If you look at the end of the nail and it’s thick and round, that’s clubbing,” Dr. Graf adds. Other signs of possible lung problems? Longitudinal, linear lesions in the nail bed or blood splinters. 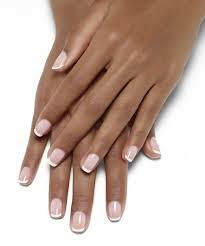 If you have any questions about your nails, skin or hair, please consult a dermatologist. Think About It: Take time to write out your goals. Writing out your goals makes you more decisive.